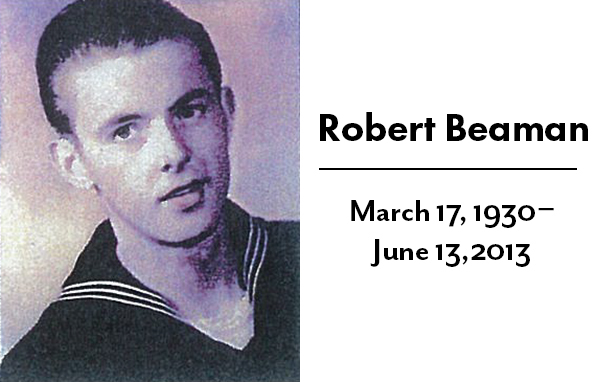 Robert (Bob) Beaman of Austin, TX passed away June 13, 2013. He was born on March 17, 1930 in Aberdeen, Washington to Raymond and Gertrude Beaman. Upon graduation from high school, his dad signed for him at the age 17 to enlist in the US Navy. He served during the Korean and Vietnam Wars. In August, 1955, he was responsible for taking the SS Lexington ship out of mothballs from WWII and putting it back into service. He was proud of the USA and serving his country for over 22 years and retired as a Master Sergeant from the US Air Force. He started Beaman Metal Co. in 1972 and now has the entire family involved. Bob enjoyed a stay of 4 months in Ecuador, for many years, to visit and help the people in that area. Even though he wasn't a Rotarian, he saw a need at a deaf school and helped coordinate the East Austin Rotary Club and the Ecuadorian Club with a matching grant. Bob was very supportive of his wife, Margarine as she started a project for the blind and visually impaired. She spent many hours away from home on making accessibility and independence for the blind locally, statewide, nationally and worldwide. Survivors are his wife Margarine of 40 years; a brother and sister-in­ law Harold and Geraldine Geistweidt of Mason, TX and his sons, Ron Beaman and wife Barbara and Richard Beaman and wife Melinda; several foster children; many grandchildren and great-grandchildren; numerous nieces and nephews and their families from many states and Australia. He had two sisters, Mardella Roseborough and Lorene Melson who passed before him. A Military burial service was held at the Central Texas State Veterans Cemetery in Killeen at 10:00 am on Monday, June 17 2013.